If you recall, in part 2 of 'The Story of Bloody Bill Anderson (part 2),’ after the skirmish in St. Clair County, Missouri, where a Union regiment took the word of a Confederate sympathizer that a small number or Quantrill Raiders were camped near his farm, the Federals took a relatively small regiment to knab the leader of what was essentially a group of guerrilla fighters: William Clarke Quantrill. It was during that altercation in 1862 that Bill Anderson experienced an injury that limited his involvement with further hostilities for the next two weeks. It was during this time that Quantrill’s guerrillas captured Independence, in part resulting in Quantrill receiving a captain’s field commission, which Anderson opposed. 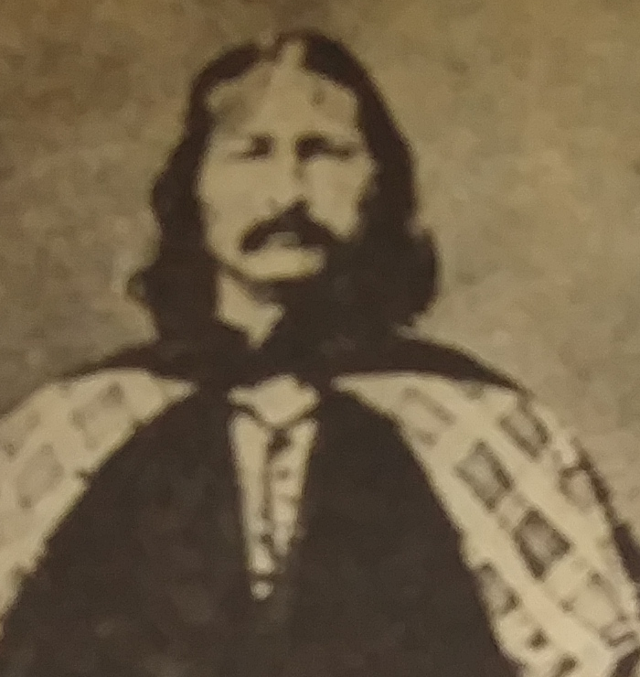 Although the author of the Bill Anderson story stated that no one knew exactly why Anderson adopted such resentment, but Quantrill’s commission created a tension between the two men. In the meantime, Quantrill made the decision to move the organization south to avoid winter weather. They spent that time with General J.O. Shelby’s command in Arkansas. In March of 1863, Anderson and a few others from Quantrill’s group returned to Kansas City where they continued to wage war against the North. It was during this period that Anderson reconnected with his family. According to McCarter, Anderson remained in contact with them until his death in October while fighting at Old Albany in Ray County, Missouri. One of the things I found interesting about Anderson’s battle strategy was the ingenious use of stolen Union uniforms. For example, according to McCarter, Anderson’s relatively small band of fighting men would dawn Union uniforms and spend time drinking with Union soldiers, eventually finding a pretext to lure them to a nearby alley where they would kill them in an assortment of ways. That’s only the beginning. “Masquerading as work details, they frequently waylaid wood-cutting and wood-gathering parties in the Big Blue River section between Kansas City and Independence. On one occasion, they hanged five Federal soldiers within 200 yards of a bridge-building detail composed of almost 100 men,” says McCarter. Quantrill, along with Todd Younger and Anderson, had developed an enormous network of individuals throughout Missouri and surrounding states that were willing to risk death to provide vital information. This network provided actionable intelligence that enabled Quantrill’s relatively small group of 200 to effectively engage a much larger fighting group comprised of 10,000 or more in the same relatively small geographic area without being discovered. One of their tactics was to attack a column of Union soldiers on the move at full gallop with a revolver in each hand. By waiting to fire on the enemy until they were physically upon them, they were able to engage a sizable force, killing and maiming 40 to 50 each time. These quick and rapid attacks also was demoralizing to Union troops, all of which was intended to cause disruption and disorganization. 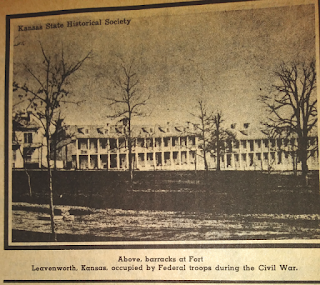 “The military road between Independence and Kansas City was frequently in the hands of one guerrilla band or another. At one time, they captured the mail rider for six consecutive days,” says author McCarter. One of Bloody Bill’s men, Jim Vaughan, was captured in a barber shop as he was getting a shave and a haircut. Dressed in a stolen Union uniform, a Federal soldier recognized him as a Quantrill fighter. William Clarke Quantrill made an offer to exchange Vaughan for a Union Lieutenant, sergeant, and a private, but the offer was refused. According to McCarter, before the Federal authority hung him, Vaughan told them, “You can kill me but you can never whip us. A hundred of you will die if you hang me!” Vaughan was subsequently put to death by hanging. Quantrill, Anderson, and the rest of the guerrillas sought to make good on Jim Vaughan’ promise, and that they did! Because Bloody Bill and Quantrill was causing so many problems for the Federals, it was decided that all the women and girls associated with the Confederate fighters would be captured, arrested, and detained in the Union Hotel. Subsequently 100 women were arrested and held. Although they were treated well, an unfortunate accident took place on August 2, 1863. The four-floor structure fell into a heap of rubble. The tragedy that day touched Bloody Bill in a most personal manner. “Josephine and Mary Anderson were arrested on July 12 and confined in the brick building. Their 10-year-old sister Jenny was permitted to visit with them and finally to remain with them,” McCarter said. All three girls were Anderson’s sister. While Mary and Jenny survived the cave-in, Josephine died. As you can imagine, Anderson and the rest of Quantrill’s hardy band of impassioned fighters did all they could to kill and plunder Federal forces within their reach. There is so much more to the Bloody Bill Anderson story, but WMD coverage stops here. To learn more about Bill Andrews’ exploits and that of the Quantrill Raiders, follow the links below. You also can purchase the Winter 1978 issue of Old West magazine (there is only one in stock, so buy it now), available in our online store (click here). if you’ll recall, young Bill Anderson and the guerrilla fighters he was with--also referred to as Quantrill’s Raiders--had just persevered in a skirmish with the First Missouri Cavalry at the farm of Samuel Clark, near Pink Hill. 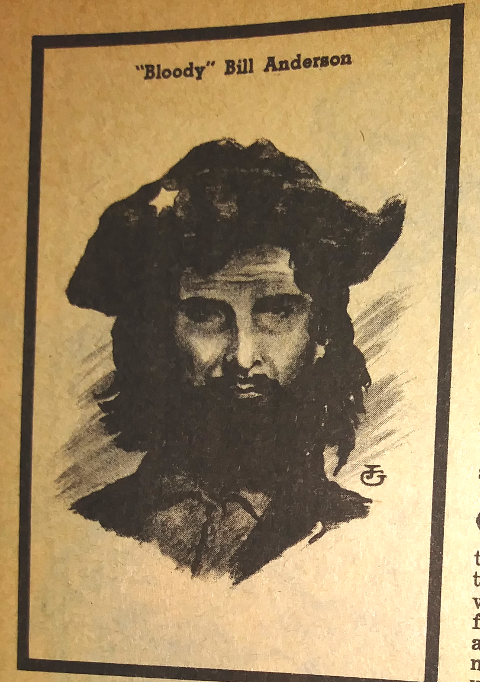 If you recall, this story from the past appeared in the winter 1978 issue of Old West magazine. It was on March 30, 1862, when Anderson and the Quantrill Raiders bumped up against 60 federal soldiers under the command of Captain Peabody. Thanks to the military prowess of Quantrill, half of Peabody’s men were killed during the skirmish. The next confrontation between Quantrill’s organization and federal troops took place on July the 9th, 1862. Anderson and the rest of Quantrill’s men were camped out on Sugar Creek. It was almost dawn when word reached camp that the First Iowa Cavalry, consisting of 90 men, was approaching. 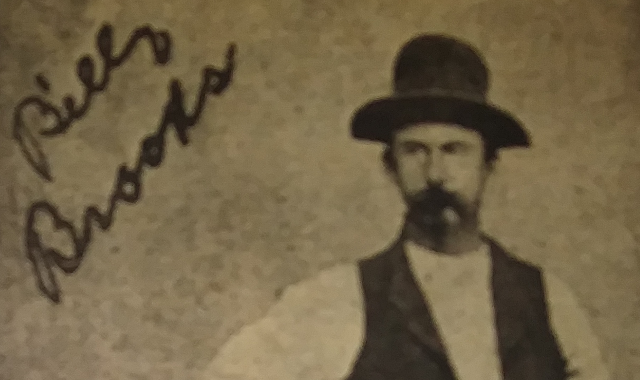 According to the author of the Old West story, Quantrill then said, “Probably we should change your name to ‘Bloody Bill’,” and they did because after that Quantrill and his Quantrill Raiders did exactly that. The next encounter that Bloody Bill and the Quantrill guerrillas had was at Sears Farm, which was owned by a Confederate sympathizer. 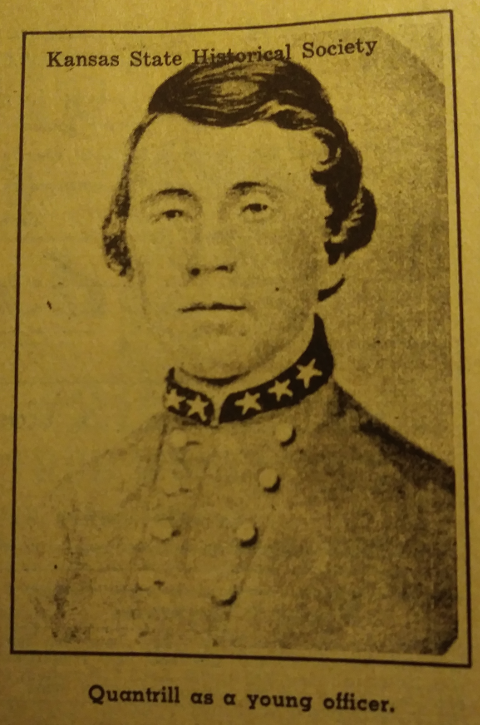 As mentioned before, Quantrill was known for his intuition or military prowess, whichever one it truly happened to be. If you recall, Bloody Bill Anderson acquired the same knack and did use it when planning a mission. “Quantrill’s intuition, or military genius, led him to anticipate the move of the enemy and to be ready for them. In some instances, he set a deliberate ambush,” says author McCarter. It was at Sears Farm that the First Missouri and Iowa Cavalry, in conjunction with federal troops, met their match when attempting to overtake Quantrill Raiders. 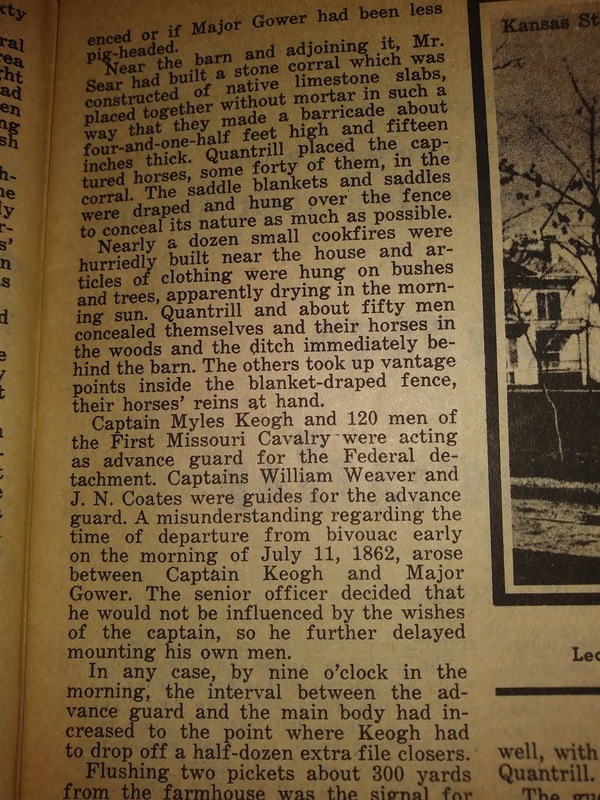 The First’s 120-man detachment, under the command of a Major Gower and a Captain Keogh, road into an extremely well thought out ambush (click on the photo of the magazine page on the right) that led to the deaths of them all. Quantrill arranged it so it looked like his troops were unaware of the enemy’s approach. This resulted in the cavalry rushing the encampment, thus expending most of their ammunition in the process. It was then that Quantrill’s guerrilla fighters struck, killing every last one of them. 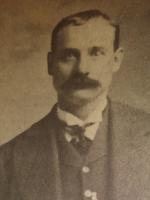 According to McCarter’s account in the slowly-fading pages of Old West magazine, Cole Younger, a well known gunfighter from western times, maintained that Bloody Bill Anderson fired his last couple of rounds into the deceased bodies of those who were already dead. Near Butler in western St.Clair County, Missouri, Quantrill allowed Bloody Bill to plan an operation with only a few minor changes. Because there was a two-week lull in the fighting, Bloody Bill was ready to lure federal troops into the open. His plan, as you will see, was a resounding success. 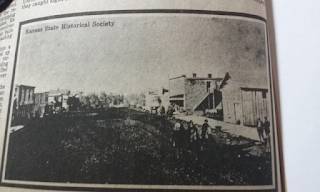 A local farmer, a Confederate sympathizer, approached Union troops, telling them that 40 to 50 of Quantrill's men were hanging about his farm. Colonel Warren of the First Iowa Cavalry, believing his story, dispatched J.W. Caldwell to take Quantrill into custody. Although he left the garrison with 140 men, only 40 or 50 returned. 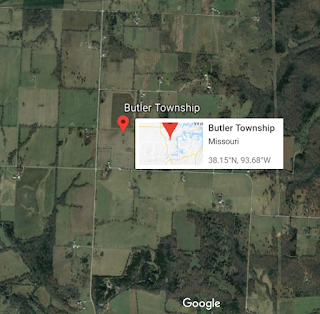 Quantrill set up an ambush about a half mile toward Butler and that is where approximately 100 men lost their lives. It was in that skirmish that Bloody Bill was wounded, taking him out or the action for about two weeks. “He had taken a rifle ball burn on his upper left arm which was not serious but was extremely painful,” said McCarter. The encounter that earned Quantrill a field commission, thus making his guerrilla Raiders a recognized organization of the Confederate Army, was that of the capture of Independence, Missouri. 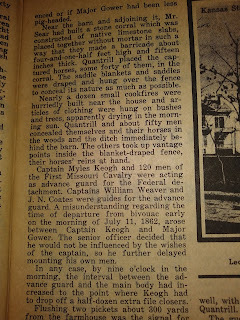 On August 15th, 1862, Quantrill was given the rank of Captain. 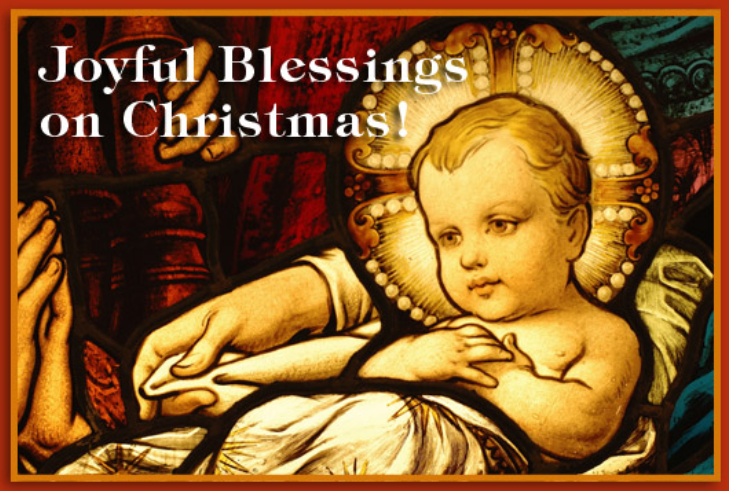 It's Christmas, Rent or Buy Today! The major TV networks in 1989 were offering much of the same old sitcoms and glitzy game shows that many viewers were finding to be greatly lacking in content, which meant that the time was right for a really good new western drama to make its way into our living rooms. And it arrived in the form of a short mini-series they called Lonesome Dove. 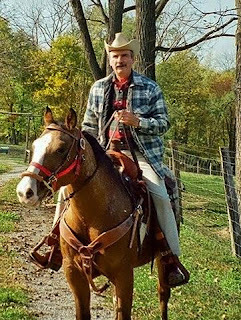 As with many successful TV productions, Lonesome Dove was based on a true story, and with excellent actors such as Robert Duvall, Tommy Lee Jones, and Danny Glover as some of the main characters, so the story line came alive and was believable. While the names of Charles Goodnight and Oliver Levy were not used in the TV production, the characters of Augustus McCrea (Robert Duvall) and Woodrow F. Call (Tommy Lee Jones) represented the real-life characters of Goodnight and Levy respectively, in the well-directed four-part miniseries. The show is an adaptation of the 1985 novel of the same name written by Larry McMurtry. The 1985 novel was based on a screenplay collaborated by Peter Bogdanovich and McMurtry, and was supposed to star John Wayne, James Stewart and Henry Fonda. But the film was never produced after movie mogul, John Ford advised Wayne against it. However, a segment of the true story of Lonesome Dove was adapted into another John Wayne movie called The Searchers. In the John Wayne movie, the story line evolved around a mission to rescue a girl who had been abducted by Indians, as was told in part in the true story that Lonesome Dove is based upon. The award-winning TV miniseries drew a huge viewing audience of an estimated twenty-six million homes as it evidently reminded folks of how much they had missed a good western story. Lonesome Dove was complete with an ample amount of good guys, bad guys, renegade Indians, and heroines. While Lonesome Dove was most certainly popular with people like me who enjoy a well-produced action western, I'd venture to say that it also attracted many others who just enjoy a good flick with a topnotch cast. So, it's been almost thirty years since the original Lonesome Dove legacy hit our TV screens. I'd say that it's about time for new classic western drama series to enter the prime time TV market. It's Christmas, so buy yourself, a friend, or a loved one, one of the following on the Lonesome Dove miniseries. Not only will you be happy you did, but you'll help WMD work with the lights on, so thank you much! 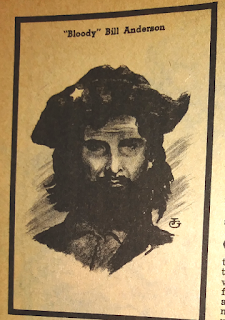 In "The Story of Bloody Bill Anderson (part 1)," published in the December 8th edition of the Western Magazine Digest (WMD), we covered a crucial incident that took place when young Bloody Bill Anderson was on the run toward the Missouri border where he expected to find safety. It was then, in the loft of that old barn that Bloody Bill came face to face with John McCorkle, the purveyor of his ultimate destiny with the Missouri Partisan Rangers, which eventually included his own command. At the time, McCorkle rode with William Clarke Quantrill, Commander of the Quantrill Raiders. Quantrill's Raiders, which was active from 1861 to May of 1865, took an active part in the Confederate military forces of the time. This guerrilla-type group was part of the Partisan Rangers, in which there were more than 400 members. There is so much more to the Missouri Partisan Rangers. For more information on the Quantrill Raiders, Bloody Bill Anderson, John McCorkle, William Clarke Quantrill, and all the other brave souls that fought to preserve the safety and rights of the fair citizens of Missouri, consider some of the following as Christmas gifts for those brave souls you love and treasure. Give them the gift of history and a proud heritage. Bill Anderson was only 22 years of age when his life took a sudden turn. He went from an apathetic bystander to the American Civil War to that of a skilled fighting machine almost overnight because of the deaths of two family members by northern forces. Bill and his brother, returning from delivering cattle to Fort Leavenworth, were horrified with the realization that their father and Uncle were dead, hanged by Union soldiers. "Bloody Bill," as the locals began calling the young Anderson, began his own campaign of death and destruction that very evening when he murdered a Union sentry by breaking his neck. The next evening, according to McCarter, a second sentry was murdered, very close to where the first one was killed, only this time he was nearly discovered by another Union soldier who arrived to relieve the murdered watchman. This happened while Bloody Bill was stripping the dead sentry of his uniform. 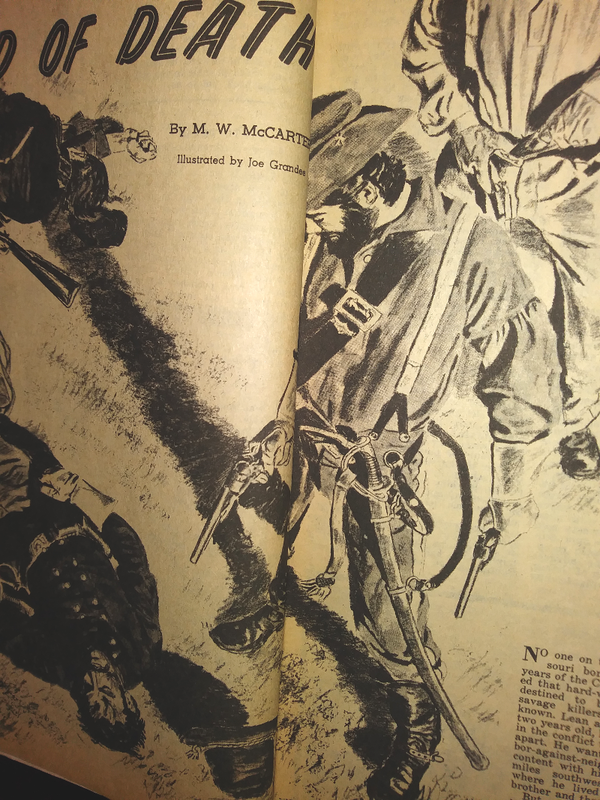 “He immediately swung the liberated revolver into action and put two 0.36 caliber balls through the breast of the approaching Federal cavalryman,” says McCarter. He took the uniforms, arms, ammunition, and horses of both soldiers. His intent was to reach Missouri. The following is a documentary that provides a splendid view of Bill Anderson and his life. 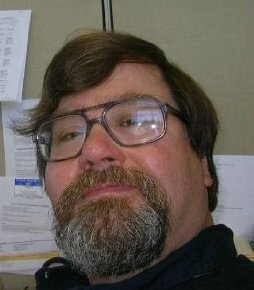 He actually was born and lived in Dover, Ohio, no more than 15 minutes from the hometown of both WMD authors! In this documentary, you will find details that were not originally included in author McCarter's story in Old West magazine. The story, as provided in all five parts of this series, are based on McCarter's article, which is most likely the "official" version. The reason why "Bloody Bill" headed for the Missouri border is that this state was divided in its allegiance. “During the American Civil War, Missouri was a hotly contested border state populated by both Union and Confederate sympathizers. It sent armies, generals, and supplies to both sides, was represented with a star on both flags, maintained dual governments, and endured a bloody neighbor-against-neighbor intrastate war within the larger national war” (click here). McCarter's story in Old West magazine. Tired from two days of riding without sleep, he stopped at a confederate sympathizer’s farm where he decided to stop and get a few hours of sleep, using the hayloft. Just then, John McCorkie, a member of Quantrill’s Raiders, the very guerrilla fighters that had conducted raides southwest of Aubrey, near Bloody Bill’s farm, quietly informed him that he had his own revolver cocked and ready to fire, suggesting that they sit and chat for a bit before firing. After a brief discussion, Bloody Bill became an important piece of that organization’s operations, and hence, our own history. It was under the care of the Quantrill fighting machine that Bloody Bill Anderson became a well-trained fighter for the ideals and political support of the Confederacy. 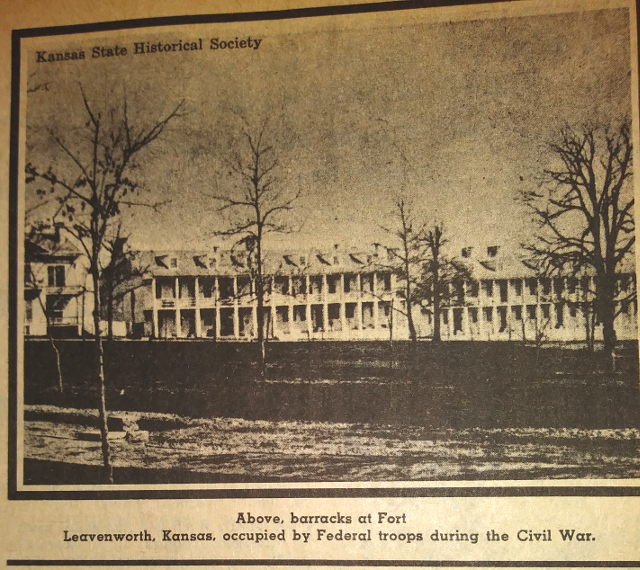 The barracks at Fort Leavenworth. The guerrillas fought two battles on March 22nd of the same year, only 10 days after he entered the fight. The first skirmish at Big Blue bridge was successful, but Union soldiers managed to surround them that evening while Bloody Bill and his compatriots slept at Tate’s farm. “After a brisk exchange of rifle and revolver fire, the Union soldiers managed to set the house afire and it was necessary for Anderson and the others to push out one wall in order to escape,” McCarter says. Unfortunately, they left their horses behind as well as 4 members of their fighting group. 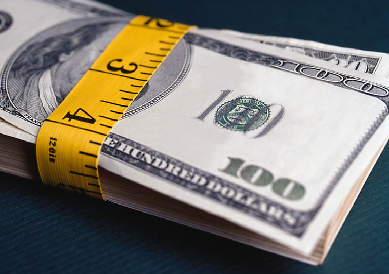 If you find WMD stories and other resources interesting and entertaining, please consider supporting our work by purchasing one of the following informational resources on Bloody Bill Anderson and the American Civil War. Or, perhaps one of our Collectible Magazines in our WMD store (click here). When I mention the topic of ghost towns of the old west, many images come into our minds. Some of our impressions of those old towns have been formed by the old movies and TV westerns we watched. Some of you may have even visited some of the well restored or re-created western towns that have become popular tourist attractions. But many would consider that the true 'ghost' towns are those that were abandoned and left for ruin. They are the ones where there may be only one building standing, or just the shattered remains of a building or two. 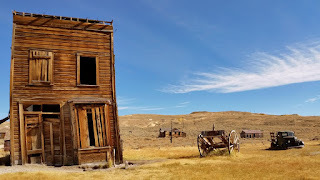 While the commercially operated old western towns have some very knowledgeable guides and narrators who can accurately describe the history of the location, there has got to be something special about tracking down some of those real old ghost towns, and searching out your own information about them. Most of these towns started out as a hub for whatever local industry was prominent. There were the cow towns of the cattle industry, the oil towns near the rich oil fields, mining towns, logging towns in the higher elevations, and the towns that started as nothing more than a water stop for a railroad line. That last example is where we got the term, “one tank town,” where a single water tower awaited a thirsty steam locomotive on its way to somewhere down the line where greater prosperity from a larger population made the trip worthwhile for the railroad. But many of these obscure remote stops soon added sleeping and dining facilities and maybe a saloon for the railroad employees. Then later more buildings were constructed to accommodate RR passengers and others who might want to settle there or just spend some spend time there. Many of these tiny towns became boom towns as the expansion of the west took place, and prosperity peaked related to the industry upon which the town was built. And thus they began to fall when their specific industry failed. It's called progress, I guess. Some of the railroads that once fed these small towns found it more profitable to alter their routes into the larger cities. Many oil fields went dry and many mines were depleted, and then their towns began to fold, and then fall to ruin as well. I did some web searches to locate some of these true ghost towns, and have selected a few to comment on. I decided to list what appears to be the last wild west town to be built as my first one on the list. They called it Whizbang. Whizbang, Osage County, Oklahoma (see video below), was likely the one of the last, or maybe 'the' last old wild west town to be founded (1921), and just about the last to completely fold (1942). As an oil boom town, it attracted some of the toughest and roughest men of the west who earned their wages from the hard and dangerous jobs offered in the oil fields. With what we would call primitive oil rigs today, these men helped the oil companies produce a whopping twenty-five hundred barrels of oil a day. And while not a cow town, as was symbolic of the old west. And Whizbang certainly had its share of brawls and shootings and killings and bank robberies. You could depend on big trouble from the town's bad guys on a weekly, and sometimes on a daily basis. Whizbang was not so willing to adapt to the modern civilized life of the 1920's that was then more prominent across the United States. Although known by the popular name of Whizbang, the bureaucrats of the Postal Service decided to change the name of the town to Denoya not long after it was founded. But it will long be remembered as Whizbang, which is more fitting to its legendary wild west occupants. But with its total dependence on oil production, when the oil dried up, so did the town. It went from nearly 300 businesses down to zero in no time. By 1942, the post office officially closed, and Whizbang / Denoya was left to become a ruinous ghost town. Here are a few more 'ghost' town locations where at several of them, some folks claim they've actually seen ghostly figures appear. Rhyolite is located on the eastern edge of Death Valley in the Bullfrog Hills area about 120 miles NW of Las Vegas. 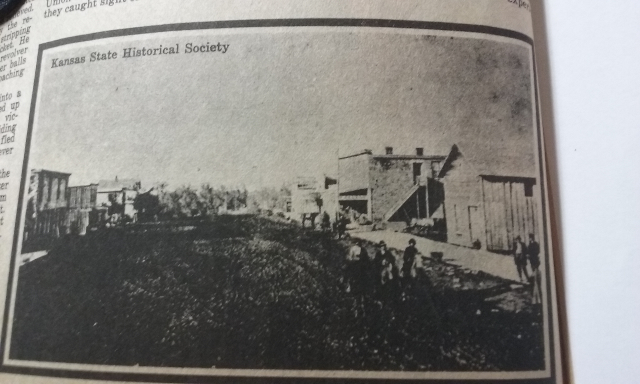 Early on, the town received some solid financial backing by Charles M. Schwab, and the mining town's population and prosperity took a sudden rise in 1907. But after some natural disasters and monetary failures, Rhyolite continued to decline until the last of its residents left in 1920. Formerly named Forest City, St. Elmo was once a major mining center. First settled in 1878, its population grew to 2,000. But by 1930, there were only seven people remaining. 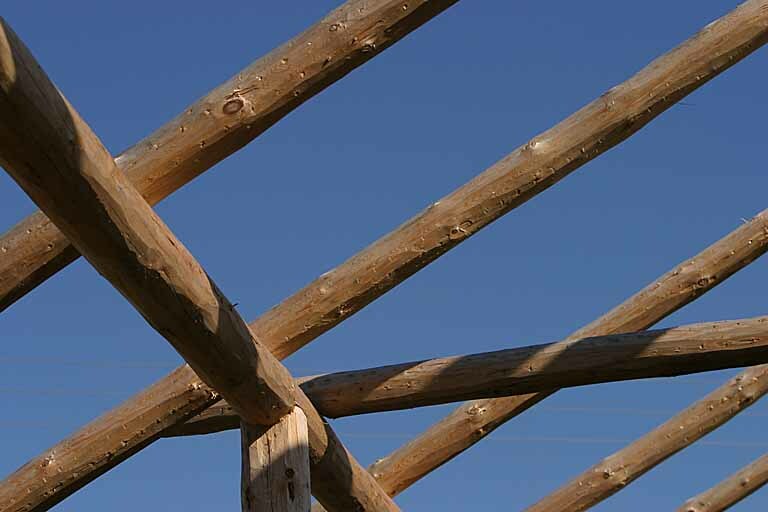 The site is now privately owned and maintained and open to visitors who happen by, but there are no typical tourist attractions there to distract from its authenticity. Present day St. Elmo has a reputation of having the most paranormal activity in the state of Colorado. 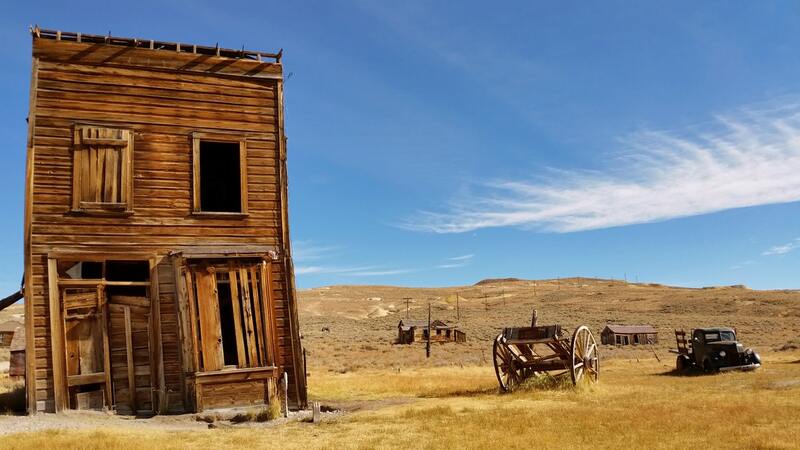 Located in Mono County, CA, this site was established in 1859 as a gold mining town, and was named after one of their pioneer miners, William Bodie, who had perished in a blizzard while on a supply trip. The town has been left virtually untouched for 150 years. Visitors may get an eery feeling when they look inside the shacks that are still standing and see the tables with cups and dishes all set waiting for their 'departed' residents to return. The massive size of this ghost mine adds to its forbidding appearance. Located in the middle of Alaska's massive Wrangell–St. Elias National Park, Kennecott was in operation from 1911 to 1938, and employed some 300 people in the town and just as many in the mines. Copper was its commodity, and it was said that $200 million of the metal was processed there. Tours are provided of the 14-story mill and other buildings by the National Park Service. Tours, yes. But Kennecott is not your typical 'tourist' attraction. This desolate old town is another one that is supposedly rich in paranormal activity. Founded in 1862, Bannack became a typical wild west gold rush town. There is a road that runs between Bannack and Virginia City, Montana that became plagued with more holdups, robberies and murders than almost any other stagecoach route. The mine lasted longer than most old western mines as it operated from the 1862 era to 1950. And with almost 60 structures to explore, the adventurist traveler might want to set aside a few days (or weeks) to cover the whole complex. Another gold mining town, South Pass City was founded in 1867 and is located in the Rocky Mountains about 10 miles north of the Oregon Trail on the Continental Divide. When things were booming, there were about 2,000 residents in the town, mostly made up of the usual rowdies who frequented the saloons and brothels of the town and the proprietors who ran them. But since the gold deposits were sparse, the miners started to leave and things really bottomed out by the mid-1870's. But through all of it, a few families still remained in South Pass until 1949. And presently, a dozen or so residents have returned to live among the 30+ preserved historic structures. Most likely some of them have a few interesting stories to tell as passed down from their ancestors. 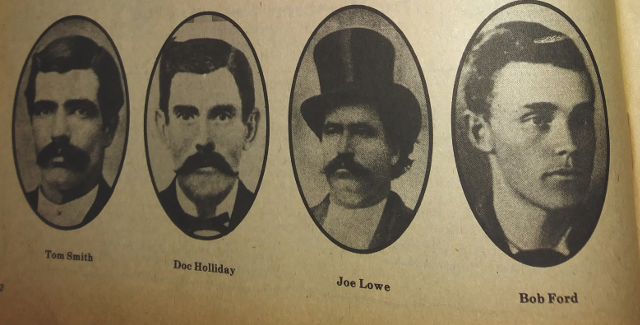 One of the attributes centering on all Old West magazine stories is that all of them were/are well researched, documented, and presented in print. 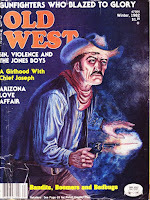 This includes "The Men Who Fired In Anger," by Bill O' Neal, as published in the 1982 Winter issue of Old West Magazine. 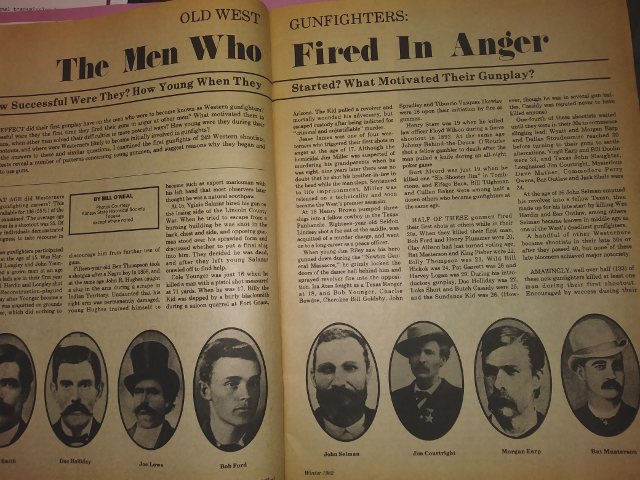 This story delves into the issue of famous gunfighters of the old west. Upon examination, I found that some of them I'd heard of but many more I hadn't. Of course, O'Neal's article did not examine all 249 that was part of an overall research program cited in the very first paragraph of the article. "At what age did Westerners commence gunfighting careers? This statistic is available for 136 (55 percent) of the 249 gunmen examined. The average age for a first-timer in a shootout was 25. Of course, many individuals demonstrated early a willingness to take recourse in gunplay," says O'Neal. Billy the Kid: 17 years old killed a man who slapped him at Fort Grant in Arizona. Jesse James: Killed a man in anger at the age of 17. Jim Miller: Suspected of killing his grandparents at the age of 8; was 17 when he was sentenced to life for killing his brother-in-law as he slept. "Miller was released on a technicality and soon became the West's premier assassin," says O'Neal. Henry Brown: Was 18 when he experienced his first gun play killing a man with three slugs. Seldon Lindsey: Killed a man at age 18, was acquitted, then went on to become a law enforcement officer. Jim Riley: After seeing someone he admired gunned down, killed all of the men involved in the incident. Ira Aten: At 18 fought a Texas Ranger. Henry Starr: This gunman was 19 when he earned his title after killing a peace officer. 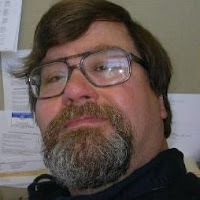 Johnny-Behind-the-Deuce O'Rourke: Was a gambler who killed another during a card game when the latter pulled a knife (hence the old saying, 'Don't take a knife to a gunfight.'). Burt Alvord: Killed Six-Shooter Jim at the age of 19. Be sure to see the HOT! section (look to the right) where you'll find documentaries and other videos on famous gunfighters of the old west. 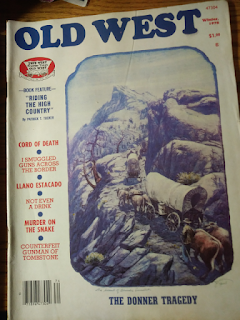 For the individual who would like to know more, the Old West magazine that this story came from is for sale in our shopping section. 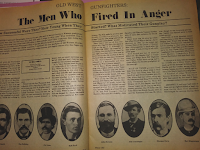 Check out Gary Miller's story, "Gunfighters Then and Now," published on Nov. 3, 2018: click here! If you find this story interesting, consider purchasing one of the following books or DVD's on famous gunslingers. Thank you for helping us keep the lights on.